I am an ABTC Registered Clinical Animal Behaviourist and full member of the Association of Pet Behaviour Counsellors (APBC). APBC members have a wealth of experience and if your dog’s or cat’s behaviour is causing you concern, I can help you understand the problem and work towards modifying the behaviour. The APBC was set up to help ensure that pet owners can get properly qualified and experienced help for their pets in what is largely an unregulated field where anyone can claim to be a pet behaviour specialist. Members of the APBC must practice according to the highest professional standards, knowledge and expertise. As stated on their website – “The APBC represents a network of behaviour counsellors that have achieved the highest proven academic and practical standards available in the field of companion animal behavioural therapy”. 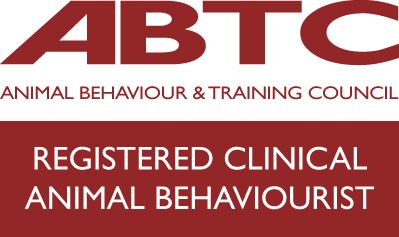 The APBC are founder members of the Animal Behaviour and Training Council (ABTC) which maintains the national registers of appropriately qualified animal trainers and animal behaviourists. AbbeyPet is a fully insured practice and currently provides behaviour services for the owners of cats and dogs. I also specialise in LifeSkills training for puppies and can help with one to one dog training. I have worked with and studied cats, dogs and other animals for many years. I graduated with a BSc (Hons) in 1988, after which I began veterinary nursing for the PDSA (People’s Dispensary for Sick Animals) in East London. I then went on to gain my MSc and a PhD in Biology (Animal Behaviour and Physiology). I have been actively involved in animal behaviour and welfare research for over 17 years. I regularly attend continuing professional development (CPD) opportunities to keep up to date with dog training methods and advances in behaviour modification , including studying with Newcastle University doing some CPD modules from their MSc Applied Animal Behaviour and Welfare. I sadly lost my gorgeous English Springer Spaniel Pippa in 2018 but am currently owned by two rather lovely horses, Buster and Fergus! I am a keen advocate of force-free training methods and believe strongly that flexibility and adaptability are key to helping people achieve a happy and positive relationship with their pets. I firmly believe that all training should be built upon a foundation of scientifically proven learning theory and knowledge of behavioural training, and am committed to helping pet owners achieve this. I am a full member of the Pet Professional Guild. Marvin the sea-lion being cheeky after a training session! Just look at that nose!